Ironically, of all the Gresley coaches in our collection, this is the only one that is a simple third class passenger vehicle; the type that was once most numerous! 23981 was built by the Birmingham Railway Carriage and Wagon Co. for the LNER in 1936 and finished in varnished teak. It was one of many identical vehicles with the open seating layout (four seats round a table) that was to become so dominant in british carriage design until recent times. 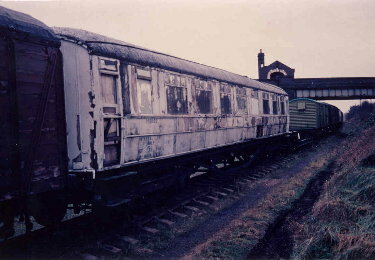 It remained in service (renumbered 13279) until 1965, when it was converted to a departmental staff changing coach, numbered DE321070. It spent the next 39 years at Perth in the company of 24080 (above) until acquired for preservation by an RVP member in 1994. Moved to the GCR, ownership was transferred to RVP and is currently undergoing a full restoration to varnished teak condition and has its own restoration page.